When I visit gardens, I’m alert to planting ideas I can borrow (of course, I’ll return them). A few days ago I wrote about the pairing of dawn redwood and cyclamen at Montrose, a pairing I’d love to create but alas, barring a terrible hurricane that destroys all my post oaks, a redwood is not in my future. I just don’t have the real estate. But the gardens at Montrose are not lacking for other attractive planting combinations. 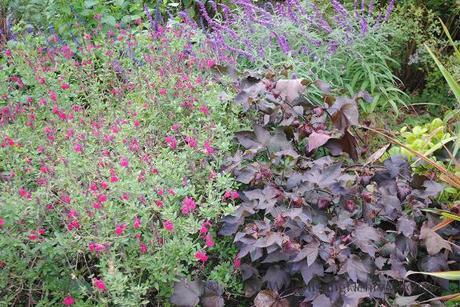 Salvia leucantha (purple flowers, at top) and Salvia gregii (pink, at left). Nancy said the S. gregii volunteered in this spot. Plants are so clever, aren’t they? This vivid combination partners Salvia leucantha (Mexican bush sage, the plant at the top of the photo with the blue-violet flower spikes) and Salvia gregii ( Autumn sage, the pink-flowered plant at left) with a dramatic plant I had never seen before. 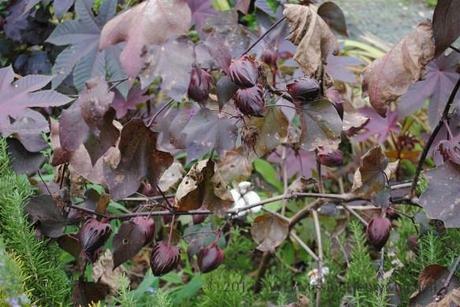 The large, dark-purple leaves stand out from across the garden, and the huge purple pods are irresistible. It offers pink flowers as well. Any guesses as to its identity? Look carefully. I love unexpected ideas like this. 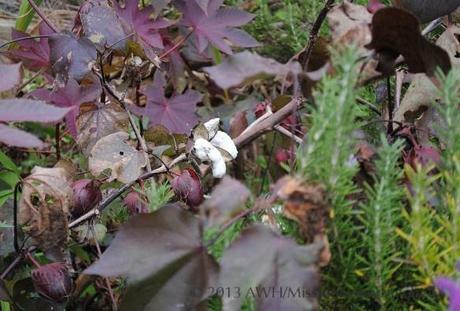 I assume this is Gossypium hirsutum, native to Central and North America. I have only ever seen it growing in roadside fields; never up-close. I like its contrast with rosemary here as well. The large pods are called bolls, and the cotton fiber (actually called lint) grows inside. If you wish to grow cotton to harvest, you’ll need a climate with at least six frost-free months (about 200 days to maturity). It likes a somewhat heavy soil. Although growing cotton for production is different from cotton grown ornamentally, take a cue from the plant partners growing with cotton at Montrose: salvias and rosemary like well-drained soil on the dry side. Cotton is perennial in tropical climates and can be harvested year-round in those locations. The pods don’t mature at the same time, though, so the plants must be gone over multiple times to fully harvest them. A cotton gin must be used to separate the seeds from the fibers, if you have other things to do with your life besides cotton-picking. I’ll stick to growing it as an ornamental.